sadly stuck into the grass in front of poor "Old Main" administration building of Western Washington University. I rush by. "Is that 1208 more mouths having to be fed each hour on planet Earth?" Over population. The grass sure does look tired and trampled. It's been winter. Lawns look beet up, dormant, full of dog droppings, litter, plastic forks. Not yet the vibrancy of spring. Next day, I look again. "NO." 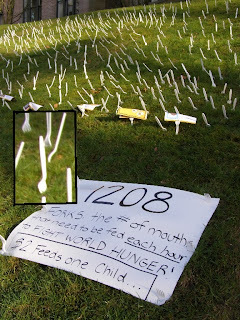 It's not 1208 more mouths, it's 1208 people who die each hour, from malnutrition related causes. 1208 each hour. Could be you or I. It's a fund raiser for university students to go with out eating for 30 hours and donate $2 to some hunger relief fund. I remember a similar campaign during my college days, so many years ago. It still seems like the poor old Earth is too crowded and burdened. One can feel overwhelmed. Ready to walk on by and forget. It's nice to be generous and charitable, but an ocean of hunger can be deeper than even Earth's "fished out" oceans. Of course fish farming and better distribution of wealth can bring more to the table of satisfaction. Still, it seems like we're losing ground. Of course compact condominiums are better than single "family values" acres of sprawl. And condoms are one of many good ideas. Let's put two and two together and address the world population explosion.